Growing up in an orphanage in Hershey, Pa., Mark Roth often heard “no” from the adults in his life. No, he couldn’t run on the high-school track or cross-country teams. No, he’d never be a scientist. Now the accomplished cell biologist at Fred Hutch may one day transform emergency medicine. More than three decades after bolting from the orphanage at age 17 into an uncertain future with a $100 bill in his pocket, Roth received a resounding “yes.” A surprise phone call in 2007 from the John D. and Catherine T. MacArthur Foundation informed him that he had received the organization’s prestigious MacArthur Fellowship, making him the Hutch’s first recipient. The so-called “genius grant” carries $500,000 of no-strings-attached support over five years. At the time, he accepted the news with an attitude as down to earth as his trademark wardrobe of Converse sneakers, shorts and a T-shirt. “The value of winning the MacArthur, the attention it brings, gives me a chance to tell young people out there who are being discouraged and told ‘no’ to not believe it — to hang on to their dreams,” Roth said. Roth’s own dreams — and dogged determination — led him to captain his high-school track and cross-country teams three years in a row, despite getting cut from the track team after his freshman season. His success in high-school track led to running track and cross country at the University of Oregon. Despite average grades, Roth’s intensity as a runner matched his tenacity as a student. Eventually he earned a bachelor’s degree in biology from Oregon and a doctorate in molecular biology from the University of Colorado. Then he spent four years in postdoctoral research at the Carnegie Institution of Washington in Baltimore. Since joining Fred Hutch in 1989, Roth has explored a variety of research paths, but his development of “hibernation on demand” has garnered the broadest attention. 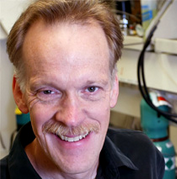 Using minute amounts of hydrogen sulfide to temporarily dim metabolism and thereby reduce the need for oxygen, Roth has successfully induced a state of reversible metabolic hibernation in mice and other model organisms. One day the technique may be used to buy time for critically ill trauma patients on organ-transplant lists and in operating rooms, emergency rooms and battlefields. “You know you’ve really made it when you’re featured in ‘Ripley’s,'” he said with a grin.